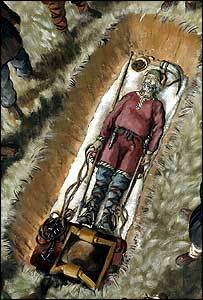 Archaeologists have made what is believed to be the first discovery of a Viking burial site in England. The burial ground is described as being among the most significant discoveries made in the UK in the past 100 years. The location, containing the bodies of four men and two women, was found outside the village of Cumwhitton, near Carlisle by local metal enthusiast Peter Adams. The site is believed to date back to the 10th Century. Archaeologists have spent months excavating the site which yielded swords, jewellery and riding equipment. The only other known Viking cemetery is at Ingleby in Derbyshire which was excavated in the 1940s, but the bodies had been cremated and not buried as in Cumbria. Archaeologists began searching the site after Mr Adams found two copper brooches. The grave of a Viking woman was found underneath, and further excavation led to the discovery of the graves of another woman and four men. Among the items found in the graves were weapons, spurs, a bridle and a drinking horn, as well as a jet bracelet and a copper-alloy belt fitting. Mark Wood, Chairman of the Museums, Libraries and Archive Council, said: "This is tremendous news, a unique discovery, which will improve people's understanding of the area and its history." Rachel Newman, of Oxford Archaeology North, said: "We could not have expected more from the excavation of the site. "It truly has been an amazing few months excavating this extremely important Viking Age site." Some of the items found are going on show on Tuesday at the Tullie House Museum and Art Gallery in Carlisle.